5 Star Review by Katie L.
Customer service is at an incredibly high level at Motor Works. They keep our vehicles running well. Staff is extremely knowledgeable, trustworthy, and good at communicating. 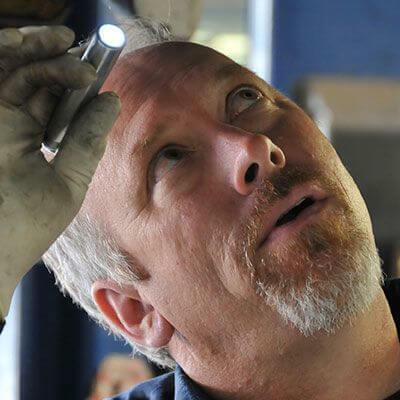 Motorworks is an honest garage that only performs the work required AND has extremely talented and knowledgeable mechanics. They aren't the least expensive, but are also not the most expensive. After checking three other garages for the same work I had them perform recently, I found motorworks to be within $75 of the least expensive garage. Since I found them to be very honest about the mechanical condition of my car, I view the money spent as an investment toward a professional relationship that I feel comfortable trusting over time. I have already shared my positive experience with some family members. I simply could not be any more pleased with my choice to patronize their business. I will likely select my future automobiles based on the makes of vehicles they service. I cannot imagine going anywhere else. Highly recommend. 5 Star Review by Daryl C.
5 Star Review by Jeff T.
I highly recommend Motor Works. My family and I have been using them for years. They are honest, reliable, professional, and knowledgable. They are always ready to help out when I call with car advice. Their staff has a family feel and they are a big hit with our toddlers too because they got adorable purple toy cars at our last visit. Thanks, Motor Works! Welcome to Motor Works Inc.
With focus and integrity, we ensure great relationships with our most valued asset… you, the client. As sensible stewards of your maintenance dollar, we consistently deliver professional automotive care in a refreshingly friendly atmosphere with compassion and mutual respect. Motor Works, Inc., has been in continuous operation since December of 1979. For nearly four decades, our clients have trusted us to maintain and repair their Honda, Toyota and Subaru automobiles, and we do our job honestly and professionally. Complimentary Copy of Greg's Book On Your First Visit! 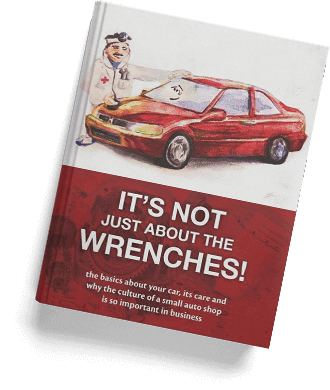 Learn all about why we do what we do, the way we do it, and gain some helpful basic car care knowledge along the way! We Care. We Just Do. Complimentary Coffee, Wi-Fi, and Smiles Well appointed waiting area with everything you need to stay connected while on the go. Complimentary Loaner Vehicles We keep you moving, giving you our car while we care for yours. Before & After Hours Drop Off/Pick Up We have options for the early bird, and the night owl. 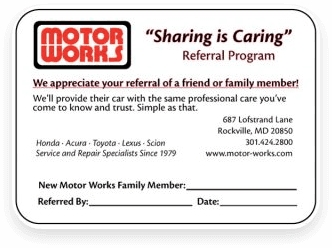 Community Supporting Community Local sports teams, boy scout troops, and more have been sponsored by Motor Works, Inc.
On Call Client Services We're here even when we’re not here! Pain Relievers Credits off your service when prescheduled, retired, and more. 2 Year, 24,000 mile Warranty On everything we do - some items are warranted for life! Here at Motor Works, we truly appreciate when our clients send their family and friends to us. We know that they have paid us the highest form of compliment any business can receive, and we cherish the trust they have in us. In an effort to help our clients spread the word, we’ve reengineered our referral program, to make that process as simple as possible for everyone.